The story of lifting a burden, thereby a congregation. An air conditioner is a simple convenience. Maybe not the product of a transformative gift, or a changemaker in the landscape of our community. But how simple is it, really? 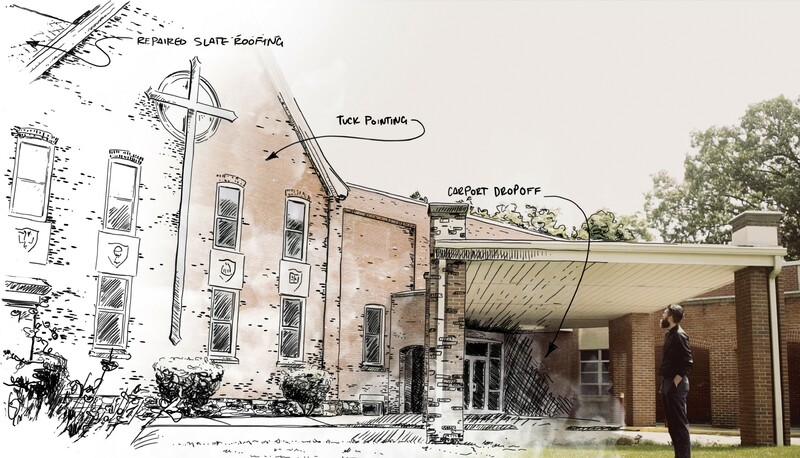 When an air conditioner is a stand-in for the simple expenditures of a lean-running institution like Faith Lutheran Church, that simple convenience becomes incredibly complex. And when running lean means changing more lives through faith and practice, that simple convenience translates to community transformation. 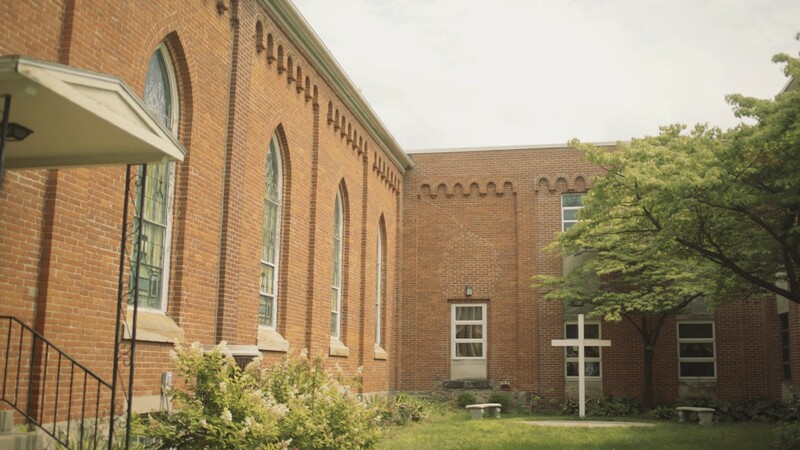 Such is the story of how the Community Foundation empowered a young pastor and his historic church to spend more time focused on the evolving needs of his growing flock. 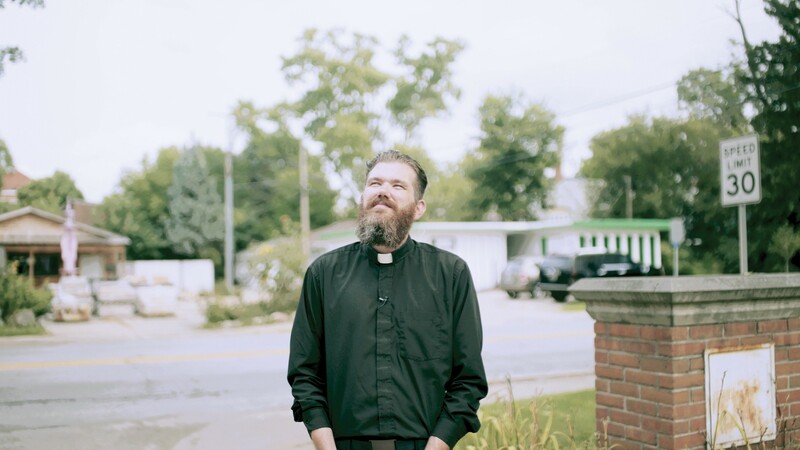 John is not your typical Lutheran pastor. His dark Grizzly Adams beard disguises his youth. The namesake of his faith, Martin Luther, once grew a beard to disguise his identity. After Luther took a stand for Reformation in front of a church tribunal, he is said to have spoken a simple line, “Here I stand, I can do no other. God help me. Amen.” The tribunal declared him a heretic and forced him out. Under the threat of violence and death, Luther grew a full beard and took on a new identity for years as Junker Jörg, or Knight Jörg. Like Luther, John has come to Elkhart to spread his truth, his conscience captive only to the word of God. Unlike Luther, Pastor John isn’t hiding from anyone. His beard is a signature. It tells you something about his way of life. He’s a man of the people, understanding the culture of his time and his town. His beard puts him in the same category of the greaser barber, the craft brewer, the young mechanic. Like them all, he’s here to practice a craft that’s increasingly rare. Unlike them, his craft has the power be a catalyst for a broken community. John is here to shepherd his whole community, not just Faith Lutheran, walking with them as they walk with the Lord. He makes his way to the front of the building from the humble lobby replete with handmade art and symbols of faith. He sports his daily uniform: dark slacks and shoes and a dark buttoned-down top. A Roman collar marks his status but only barely peeks out from behind his beard. He’s tall and slender, with a vibrant smile that makes him feel approachable even to a complete stranger. In some ways, Faith is just another building, a place for his congregation to call home. In other ways, Faith stands out in the architecture of Goshen. It’s beautiful and historic. John strolls outside, circumnavigating his church, his stark garb providing a harsh contrast against a warm summer day. He’s from New York. After growing up on Long Island, when the Lord called on him to move to Goshen, Indiana, he certainly experienced a culture shock. But John lived by that same simple mantra of Luther, and Goshen was the perfect town to see it into action. He was welcomed warmly and he quickly knew that he had found someplace special. John had a truly unique perspective on Elkhart County. Free of regional bias, he and his wife, Andrea, were both called to the region from afar, both to lead churches. John sits on a bench just in front of the outdoor baptismal. Over his left shoulder, a simple cross is mounted to the building. Opposite it, an air conditioning unit that looks more like Sputnik than any modern HVAC system. John has been consumed by the culture of Elkhart County. The people’s generous hearts and entrepreneurial spirits are the product of an interesting mix of rust-belt revitalization and an intersection of different faiths. Things are different here in Goshen than anywhere else he has been. Folks are ready to help at a moment’s notice; there was a strong sense of community that closely knits together the folks here and a roll-your-shirt-sleeves-up attitude that pervades everything. John’s eyes crinkle with his ever- present smile. He can’t help but beam as he speaks of the community of which he has become a crucial part. He was built for Goshen, and he has a church built to support Goshen in the most trying times. He shares his favorite Bible verse, which speaks volumes of the man. During the years preceding the fall of Israel to Assyria, the Prophet Micah provided some dire warnings. He spoke to the people of Judah, prophesying the birth of Jesus in Bethlehem. During this time, Israel was imploding under the weight of evil and unfaithful leaders. Israelites in Judah were prepared to do anything to wash their sins and get right by the Lord. Micah gave them solace. Their God didn’t need sacrifice. “What does the Lord require of you,” asked Micah, “but to do justice, love kindness, and walk humbly with your God?” (Micah 6:8). Love kindness. Faith Lutheran is a support infrastructure for kindness as much as it is a church; is there even a difference? When it comes to tending to young Johannah and Matt Tremont, going through the pain of a hopeful dream dashed — the awful tragedy of miscarriage — Faith Lutheran and John himself are positioned perfectly to provide that support. John sits on the edge of a sterile bed, talking with the young couple in the hospital. He offers prayer and a warm embrace. Church elders quietly cook and freeze dinners, send sentiments, and check on the family. A delicate web of emotional and physical support undergirds the church at times like these. They’re built to lift spirits and remind Johannah and Matt of brighter days ahead — to remind them of God’s love. This is woven deep into the fabric of Faith Lutheran. Do justice. When it comes to replacing those daily conveniences like the Sputnik-shaped air conditioning unit or pooling funds to memorialize Johannah and Matt’s unborn child, the church isn’t built to efficiently tackle the problem. Typically, money is tithed and gifted to a church and pooled in a bank account. It’s managed by a council of respected church elders. And while those minds are likely to do right by the congregation, it takes a concerted effort of hundreds of man-hours to effectively manage a fund. Even in the best-case scenario, Faith Lutheran’s brightest minds would spend the bulk of their time in the bureaucracy of financial management. As part of John’s work with Faith, he has decided that the talent and time of his most trusted elders could be better used in other work than in the ledger. Micah said it himself, do justice and walk humbly with your God. In order to do justice to the time of these great minds and the money they’ve worked so hard to tithe, John has entrusted the church’s funds to the financial expertise of the Community Foundation of Elkhart County. Walk humbly. As John walks back into the building, he heads to the chapel for a moment of reflection. Faith Lutheran is the perfect embodiment of humility. No gilded statues. No ornate painted ceiling towering stories above. Eclectic furniture that has been collected over the years sits atop decades-old carpet. The church is dimly lit only after John turns the dial on a dimmer switch that comes from another era entirely. Faith isn’t fancy. It’s a place to find a family. It’s a place full of humility. It’s a place that feels like home. With the expertise of the Community Foundation at its back, Faith can replace that occasional chair, that broken pew, that Sputnik-era AC unit. The church’s money grows in an endowed fund, faster than it could have done in any privately managed fund. And when it’s time for a capital expense, access to the money is simple. In turn, the church elders are freed up to provide counsel and help in the community. And John, well, he’s able to spend a bit more time at the foot of the hospital bed or working with the choir or helping in the school. An air conditioner is a simple convenience. We’ve come to expect it. On hot and humid days like this one, as Pastor John moves from the chapel to the office, he’s thankful for those simple conveniences. When hundreds congregate weekly in the sanctuary — when they come together as a family in this house of the Lord–they, too, are thankful for the simple conveniences. But John’s story — the story of Faith Lutheran — isn’t about an air conditioner, nor is the story of Faith Lutheran. As John sits at his office desk, a place he finds himself rarely, he gathers papers in preparation for tonight’s meeting with the elders. His Bible is open to Micah as he studies for this week’s sermon. It’s on his favorite verse. Curiously absent from that desk is a ledger. Curiously absent from tonight’s meeting agenda is a financial report. It’s time to focus elsewhere and allow Elkhart County to experience that full heart of John and his elders. John’s story is not about money. John’s story is about loving kindness, about doing justice, about walking humbly, as he does each and every day in his community, his home — with his God.